Learning how to 'play the changes' is a rite of passage that guitar players must pass through to take their playing to the next level. 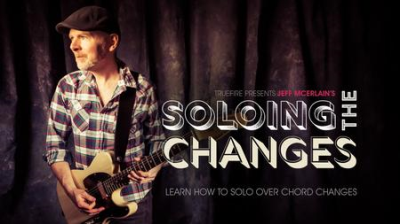 Targeting chord tones as you solo over changes is the central focus of Jeff McErlain's Soloing the Changes. Most guitar players learn how to solo and improvise with the pentatonic scale. All 5 of those notes are relatively safe to play and that's a great place to start. But after a while, those solos start sounding a little bland and disconnected from the chord changes they're playing over.